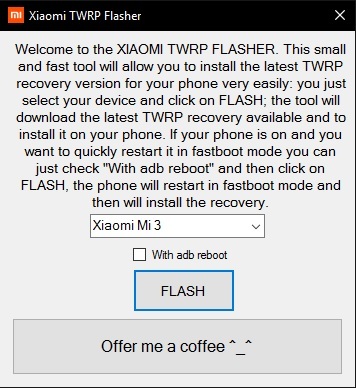 This small and fast tool will allow you to install the latest TWRP recovery version for your phone very easily: you just select your device and click on FLASH; the tool will download the latest TWRP recovery available and install it on your phone. If your phone is on and you want to quickly restart it in fast boot mode you can just check ‘With ADB reboot” and then click on FLASH, the phone will restart in fastboot mode and then will install the recovery. This tool can install TWRP Recovery via fastboot command then click FLASH and will download Flash Recovery automatically (if recovery is downloaded it will not download anymore).